tooth is different. We offer exceptional dentistry at affordable prices in the heart of Waterloo, SE1 - dental check ups, hygiene and cleaning, tooth whitening, smile alignment, clear braces, tooth implants, oral surgery, endodontics and lots more! We always go the extra mile to make your experience at tooth nothing less than exceptional. 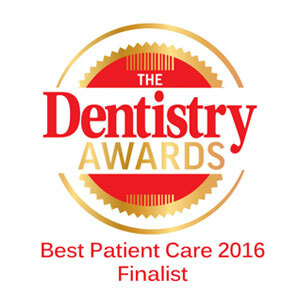 We are officially London's Best Dental Practice and we're proud of all our awards and nominations, lovely patient feedback and countless 5 star Google reviews. If you're in any doubt that tooth isn't for you, be sure to check out our testimonials page. Our surgeries and equipment is state of the art and our waiting areas are spacious, relaxed and laid back. You won't feel like you've been to the dentist at all. tooth, making dentistry different since 2014. Our tooth team are renowned as some of the best in their field - well qualified, a wealth of experience and motivated to give you the best possible treatment and customer care each and every time. All of our clinical team are fully registered with the General Dental Council (you can check on the GDC website here), and more importantly the whole team is super-nice, gentle and (unlike the stereotype) definitely not scary! LekDent, Warsaw; PG Cert. Clinical Periodontology, UCLAN; PG Cert. Aesthetic Dentistry, Eastman (UCL); Membership of the Joint Dental Faculties (MJDF) Part 1. Dr. Anna is a passionate dentist and always strives to give her patients the best possible care and attention. As well as having qualified in one of Europe’s best dental schools (Medical University of Warsaw), she also has a Postgraduate Certificate in Periodontology from UCLAN, Lancs. and a Postgraduate Certificate in Aesthetic Dentistry from Eastman (UCL), London. Anna has passed her MJDF (Part 1) examination and is currently studying for Part 2. She is always looking to develop herself both within and outside of dentistry and was a recent finalist at the Dentistry Awards for Best Young Dentist. DDM, Skopje; MFDS (RCSE) London; PG Diploma in Clinical Dental Science, Queen Mary's University London; PG Cert in Dental Implants, Bristol. Dr. Ana is tooth's Associate Dentist with a special interest in Oral Surgery and Implants. She has a wealth of experience across leading private dental surgeries across London as well as extensive hospital experience. Ana also works as a Specialty Doctor in Oral Surgery and as an Honorary Clinical Teacher at King's College Hospital in London. In addition, Dr. Ana is a member of the BAOS (British Association of Oral Surgeons), ITI (International Training in Dental Implants), EAO (European Association of Osseointegration) and ESCD (European Society of Cosmetic Dentistry). Dr. Eleftherios has been providing, teaching and researching implant dentistry since 2006 in leading teaching hospitals nationally and internationally as well as privately. He is currently appointed as a Specialty Doctor in Oral Surgery at King's College Hospital in London and in leading private practices, providing advanced surgical and restorative procedures. He has published and presented scientific work, both nationally and internationally on dental implants and sedation. Apart from quality, his priority is good, clear communication with the patients and excellent clinical work. Dr. Eleftherios is also a Member of the Faculty of Dental Surgeons (MFDS). Dr. Michele has vast experience in dentistry and endodontics (root canal treatment), having worked in dental practices in the UK, Ireland and Italy. As well as working at tooth and other leading private practices solely on endodontics, Michele also works as a Specialty Doctor in Endodontics at Eastman (UCL) Hospital. He is a member of the British Endodontic Society, the Italian Endodontic Society and the European Society of Endodontology. He is expert in microscope dentistry, great with the patients and clinically excellent. Jenny is an experienced Dental Hygienist, having worked in private and mixed practices across the Home Counties before joining us at tooth. Jenny is all about quality, empathetic and partnership-based treatments and cares massively about working with patients to improve and maintain their oral health. Jenny is from London and always had a passion for dentistry. Starting as a trainee nurse, she went on to become a Qualified Dental Nurse and then graduated in Oral Health Science to become a Hygienist in 2016. Lauren has worked as a Dental Hygienist in a variety of clinical settings including private surgeries across London and at Queen Mary’s Hospital. She is passionate about giving excellent, gentle treatments and helping patients achieve great oral health and is a real asset to the tooth team. Lauren initially started her dental career as a dental nurse, but realised her passion was in treatments rather than assisting, so instead went back to university and completed a full time degree in Oral Health Science. Click here to meet our Receptionists and Nurses. Naturally we're always going to write nice things about ourselves, but we truly know that the most important judges of our service are our lovely patients. That's why this section is dedicated to sharing just a tiny selection of the amazing feedback that they've given us about their experiences at tooth. We can't give the patient's names for confidentiality reasons, but rest assured, all the feedback above is 100% true and 100% verifiable. You can check out all of our 5 Star Google Reviews on line and additional reviews on our Facebook page, and be sure to watch our patient feedback video to see why everyone's talking about tooth. At tooth our prices aim to always offer good value for money balanced with exceptional dental care. Despite being competitive, we only ever use top quality equipment, materials and dental laboratories and we always dedicate the right amount of time to our lovely patients. Everything at tooth is upfront, honest and open. Most of our prices mention 'from' - this is simply because by the very nature of dentistry, sometimes treatments require more work than others and we won't know how long we will need or how complex the treatment will be until we've investigated. However, we always strive to charge the 'from' price wherever possible and we'll discuss everything with you along the way. We guarantee no nasty surprises at check-out! Below lists our most popular dental and hygiene treatments at tooth - please get in touch if you would like to find out the price of any treatment not mentioned below and we'll be happy to help. You may be asked for a deposit, in line with our deposit and cancellation policy, which is fully refundable with any changes or cancellations with more than 24 hours notice. Appointments cancelled or amended within 24hrs of original appointment time could result in loss of deposit. Our porcelain veneers are a great cosmetic treatment to improve the appearance of your smile in a way that looks and feels natural. Our experienced Implantologist will discuss your needs and explore treatment options with you. Fee refundable if you proceed with treatment. Learn more on our Implants page (45 mins). It's super-easy to book an appointment at tooth - simply call us on 020 7928 2875 or email us on hello@toothlondon.co.uk (or just complete the form below and press submit). We'll be back in touch in a flash and we'll do all we can to help you quickly and efficiently. We don't have online booking - it's not because we aren't high-tech, it is just that it doesn't work so well in dentistry as the time needed for most treatments varies on a case by case basis. Once you have booked, you'll be pleased to know that we are really easy to get to and easy to find too. tooth is located in Waterloo on Lower Marsh, just a few minutes’ walk from Waterloo Railway Station, Waterloo East, Lambeth North and Southwark stations and easily accessible by bus from pretty much anywhere. Now there’s no excuse to not to go to the dentist! Be brave.... come see us! Please include what treatment you are interested in - i.e. new patient exam, hygiene appointment, whitening, etc. We have limited access to emails outside of these times. Thanks again for contacting tooth. We know that Londoner’s always have a lot going on, so that’s why we’re now open even longer for you - from 8.00am - 8.00pm weekdays and open Saturdays too!